My name is Zoey Gray, and my life narrative would begin like this: I was raised in Surrey, B.C. I am a curious individual by nature, but it is thanks to my parents that I am who I am today. Growing up, I was lucky enough to experience cultural practices from both my father’s caucasian side and my mother’s Filipino side. This has instilled in me my appreciation for diversity and my desire for knowledge, and these have brought me here. People and their stories are what interest me most – I am driven to learn about how their experiences dictate their thoughts and actions. My interests have drawn me to the Global Citizens stream of the Co-ordinated Arts Program, where I will have the opportunity to study people and society in a socio-historical context while developing my critical thinking and writing skills. As I begin my studies at UBC, my goal is to deepen my understanding of the world so that I may formulate educated opinions, transform my opinions into solutions, and put these solutions into real-life applications. Currently, I am exploring the fields of psychology, political science, and international relations as potential majors for myself, and ultimately I hope to find a career in which I can contribute to positive societal change. 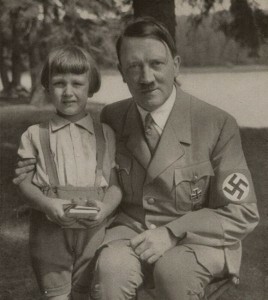 Winton, pictured here during World War II with a rescued Czechoslovakian child. Adolf Hitler, leader of the Nazi party, pictured here with a young child during World War II. It is my hope that throughout the year I will have the chance to find answers to these questions, and to discover ways in which I can make my own impact. 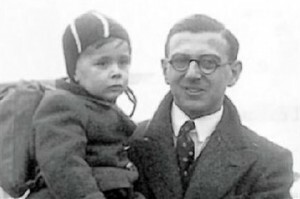 Although Winton’s actions were heroic and should never be downplayed, I am drawn to ask the question why is it this man that is so important, and received so much recognition, when there were many others willing to aid the Jewish children. This leads to the question of why are the actions of only a few people made so public in relief efforts that require the help of others? Both Winton and Hitler made a difference in the world for better and for worse, and their actions have shaped the lives of generations since. Putting that in relation to your question “how do our life experiences shape the decisions we make?” and Charlotte’s response, what makes a person worthy of having their voice heard, their history, race, gendre, charisma, or their background? Hitler was known for being charismatic and one of the best public speakers of his time and used that strength to his advantage. By inspiring his people he was able to make them want to hear his voice and opinions. Winton’s actions were also inspiring although in a different way, and people want to hear as much about a man who saved millions of children as they do a man who will bring their country back to glory. Yet, there are many who have done countless life-changing things but perhaps because of an experience in their life havent been inspired to share it with others and therefore lose their voice and no one hears about their deeds. Although Hitler is known to be one of the cruelest men in history, the conditions of the Treaty of Versailles created a downtrodden and hopeless Germany whose people were desperate for a leader. The experience of living in a hopeless environment instilled in him the desire to take the country back to its former glory. Without that incentive, he may not have chosen to go into politics. The way he imagined doing so was atrocious but his experiences inspired his decisions and actions without a doubt.